• Net investment income decreased to $18.25 billion from $20.72 billion in 2017, a 12% drop. • Fees and other revenue increased 42% to $11.35 billion from $8.02 billion in 2017. • Hotel revenue amounted to $1.25 billion versus nil in last year. Benefits and Expenses totaled $54.07 billion for the period, a decrease of 3% from $56.59 billion. The decline was mainly driven by decreases a decrease in ‘changes in insurance and annuity liabilities’ which closed at $2.23 billion (2017: $10.68 billion). ‘Net insurance benefits incurred’ increase by 16% to $25.47 billion from $21.91 billion. Administrative expenses increased to closed at $17.59 billion compared to $16.61 billion compared in 2017. Hotel expenses in 2018 amounted to $892.63 million (2017: nil), while commission and related expenses rose 18% to close at $5.78 billion versus $4.88 billion a year earlier. In addition, total benefits and expenses for the last quarter saw an 8% increase from $13.15 billion to $14.19 billion. Share of profit from joint venture amounted to $18.01 million relative to a loss of $9.71 million a year earlier. Gain on step acquisition of X Fund Group totaled $1.52 billion (2017: nil), while share of loss from associate for the period totaled $80.54 million compared to a profit of $862.85 million in 2017. Investment and corporation taxes increased to $4.17 billion for the period (2017: $2.92 billion). Consequently, net profit amounted to $13.88 billion relative to $12.07 billion in 2017. 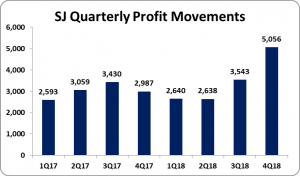 For the fourth quarter net profit closed at $5.06 billion (2017: $2.99 billion). Net profit attributable to shareholders amounted $14.23 billion (2017: $12.07 billion). Earnings per share (EPS) for the year amounted to $3.64 (2017: $3.09), while for the quarter the EPS amounted to $1.30 (2017: 0.77) . The number of shares used in our calculation is 3,905,634,918. SJ’s last traded price as at April 11, 2018 was $ 37.63. Equity attributable to stockholders of the company as at December 31, 2018 stood at $74.34 billion (2017: $68.50 billion) resulting in book value per share of $19.03 (2016: $17.54).